Smaller assembly tools, such as nutrunners, pose just as great a health and safety risk as hammer tools when it comes to industrial noise and vibration, says Bill Harrison, technical manager at calibration specialist Trescal UK. Noise and vibration are two of the most common industrial injuries. The Health and Safety Executive estimates that more than a quarter of a million people in the UK now have injuries related to hand arm vibration syndrome (HAVS) with more than 17,000 people suffering from deafness induced by work. HAVS is caused by prolonged use of vibrating hand-held machinery which is known to have a serious effect on nerves, joints, muscles, blood vessels or connective tissues of the hand and forearm. This, in turn leads to a tingling 'whiteness' or numbness of the fingers in its mildest form, through to fingers changing colour or, in its most severe form, considerable pain and loss of manual dexterity. Vibrating machinery is also often noisy. Riveting guns operate at circa 100-120 decibels which, when you consider that a jet engine is only circa 140 decibels at take-off, is very loud. The key legislation in regards to HAVS and VWF is the Control of Vibration at Work Regulations 2005 which includes a statutory daily limit on the amount of vibration any one individual can be exposed to. Noise is controlled by the Control of Noise at Work Regulations 2005. However, whilst HAVS and noise related injuries are widely accepted and understood, it would be wrong to assume that the risks are only a concern for smaller manufacturers or those with lax health and safety procedures. Only last year, a well-known and global manufacturer of power generation equipment was prosecuted after one of its employees was left with a severe long-term disability following prolonged working with a range of vibrating tools. Four other employees were diagnosed as having symptoms consistent with early stage HAVS, commonly known as white-finger. The court found that the company in question had failed to manage the exposure of its employees to the serious risks of vibration for more than 10 years and had failed to put preventive measures in place. The case highlighted a common problem in industry, namely that risk analysis for HAVS and noise is all-too-often confined to larger equipment, such as grinders, chainsaws and hammer tools, which present a clear danger to employees. However, amongst the most common triggers is smaller air powered industrial equipment used in assembly facilities, such as nutrunners, pneumatic impact guns, riveters, pneumatic torque wrenches and air tools, which possess an inherent risk to employees but are often overlooked. This situation is exacerbated by the fact that this type of equipment is often neglected, seldom getting the care and attention given to more expensive equipment. A nutrunner for example, is rarely given any sort of maintenance because, with their low unit cost, replacement is preferable to repair if anything goes wrong. Inevitably, this leaves employers at risk of litigation and, if the correct procedures and measurements have not been followed, prosecution and fines. Measurement is key. For example, an employee using a tool with significant vibration, circa 5 m/s2 for one hour would be regarded as being below the exposure action value. However, as soon as the same employee begins using the same for three hours per day they are regarded as being above the exposure action value and at risk. These parameters are broad values and do not take into account the changes that occur with any tool over time. An untested tool will inevitably be subject to wear and tear which has the capacity to increase both vibration and noise. For example, wear and tear on a bearing will increase vibration significantly. If an employer is found not to have put in place simple procedures to spot and rectify this sort of simple maintenance issue it will, inevitably, impact on its ability to fight any claim. One way of mitigating the threat is regular inspection and testing to ensure that the tool is working correctly and in line with the relevant regulations, implemented by a supplier from outside the company who is able to issue independent certification. My advice to users of vibrating hand-held tools is to get them inspected and tested at least every six months. If the tool is being used constantly on a 24 hour basis this should be brought forward to every three months. Crucially, modern testing methods are capable of reducing the potential impact on production dramatically. 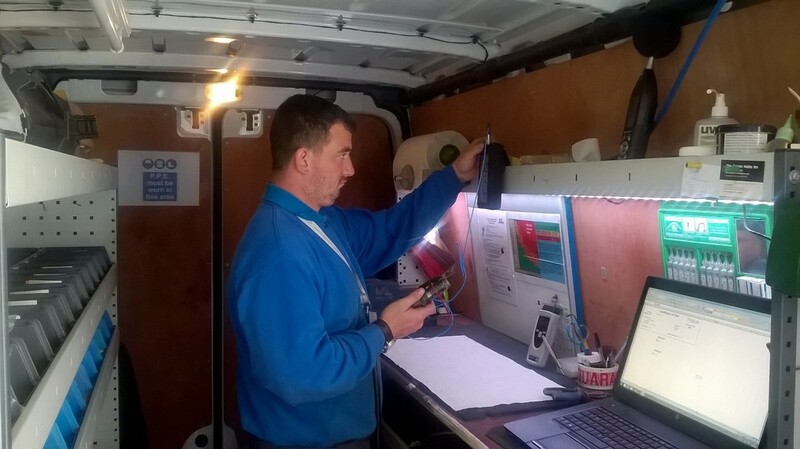 Mobile testing and inspection units are equipped with a wide range of equipment such as rotational tachometers, vibration meters and sound level meters which can test accurately for rotational speed, vibration levels and noise. The issue here is peace of mind. Once the equipment has been checked, validated and certification has been issued, there is an audit trail which can be used in any future defence action.